See anyone you know here? If so, he's probably in his 70s now. 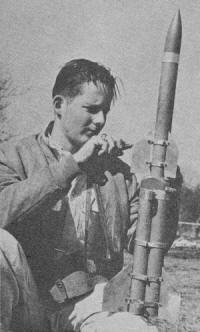 This article from the August 1959 edition of Model Aviation tells the story of a "Rocket College" where the Army allowed some of its officers to give instruction on some of the technical concepts of model rocketry from a professional perspective, including some hands-on activity at Camp A.P. Hill, in Bowling Green, Virginia. 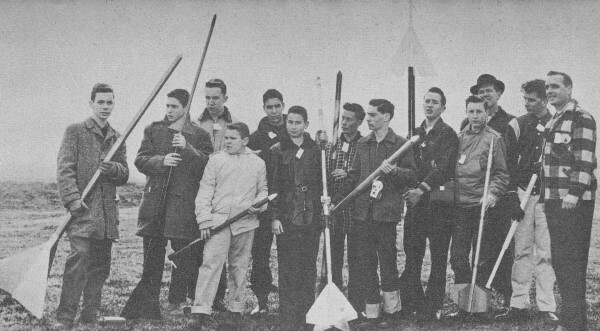 This was a time when the military very actively promoted youth aeronautical activities rather than sponsoring "Save the Earth" and diversity seminars in school classrooms. One of the things that strikes me most about seeing old photos and movies is how open and undeveloped the areas were at the time. Even in some of the old B&W TV shows like Beverly Hillbillies, you see the background shots of costal land with nothing but trees and shrubs that you know today are lined with plush housing developments and shopping malls. 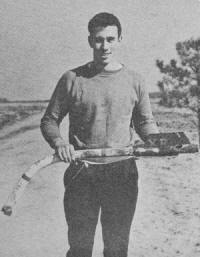 Open land is the dream of every model rocketeer and free flight model aircraft enthusiast. Sure, there have been densely populated urban areas since the beginning of aeromodeling, but truly wide open spaces are getting much harder to come by. Midwest corn fields, the upper Great Plains and the SW desert will soon be the only places suitable for such activities - that is part of the motivation for "R/C assisted" rocketry and free flight as a way of improving the chances of retrieving our models. One of the best friends a model rocketeer could have, Capt. Bertrand R. Brinley of First Army, opens missile seminar at New York University. 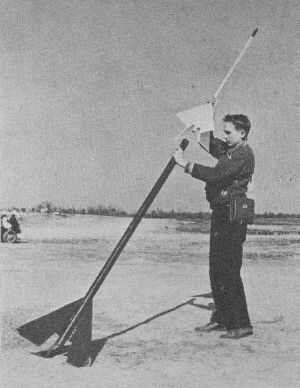 David Butcher (inset) of Brooklyn's Polytechnic; Institute, discussing nose cones, is typical of instructors who participate. [Ed] Now, I don't care to wear a neck tie any more than the next guy, but didn't the more formal dress of the day make for a more serious looking atmosphere? Compare these photos to ones in modern magazines of events where huge beer bellies protrude from under the bottoms of tank tops and scarred bare legs are on display from short pants. I'm just say'n. 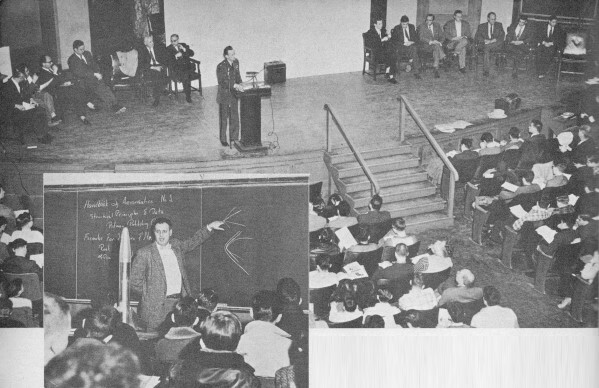 Dramatic proof of the wisdom behind an Army directive authorizing service cooperation with model missileers is the series of one-a-month rocket "seminars" held in New York and Washington with instructors from full-scale air-missile manufacturing firms and technical institutions. To test their theories and model "birds" participants were invited to Army's Camp A. P. Hill near Bowling Green, Va., for safety-super­vised "shoot." Six foot "Tycho-I" (above, right) by Monroe­Woodbury Central Valley, N. Y., High School Rocket Society, reached 1 mile altitude. Capt. 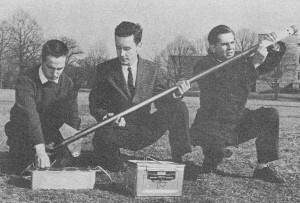 Brinley (above, left) examines 3' high, 4" diameter model from Brooklyn. Model makers gather (above) at Army's Camp A.P. Hill. Lt. Col. C.M. 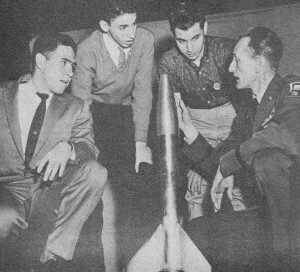 Parkin, Jr. (below, left) who was instrumental in the creation of Army-aid-for-missile-modelers program checks out entry at "graduation" firing which climaxed 15 week course. 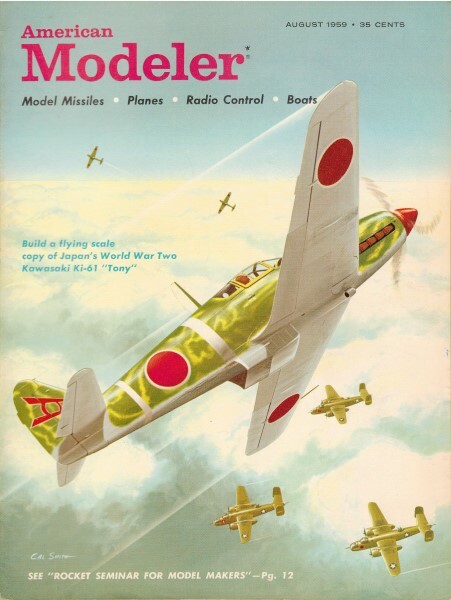 Design, construction, and fueling your model missile is only half the battle! A good launch is equally important; elaborate tower (above) provides firm firing path. Remote controlled electrical firing (below) is from protected area 75' from launch pad. Clockwise from upper left: Baltimore's Gerd Nathan tested fiberboard, 3-stage GNX-24 rocket powered by 16 separate Model Missile motors. 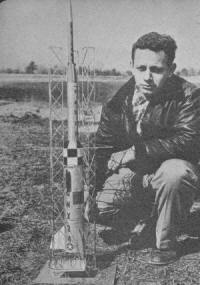 Guy Gruters of Fair Lawn, N. J., Rocket Society dubbed his 2-stager "Goliath I"; copper tube lower stage was 6'3", 2nd 5 ft. stage of aluminum. Short designer gets assist from human tripod. 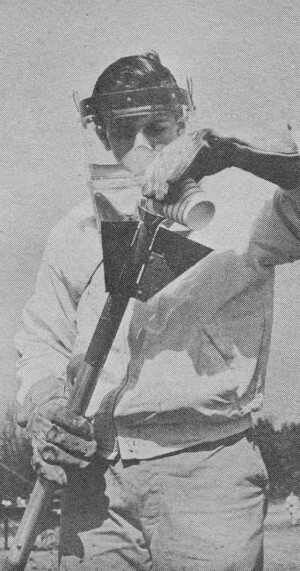 Fueling the bird: most used mixture of zinc dust and sulphur powder. 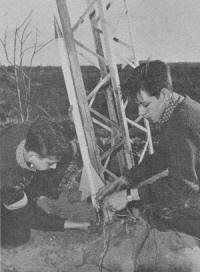 Last minute check of electrical firing system (below) by Forest Hills, L. I., rocketeers. Dramatic evidence of 1) what happens when something goes wrong and 2) the need for a safe firing range! Triple first stage, single 2nd stage bird packs powerful wallop.